This post has no point, so get over it quick before you read any further. I'm just dropping in to point out a few things that I'm a) interested in, b) excited about and c) just sayin'. First up, Amy Poehler had her baby. YAY! Also...BOO. BOO because it means not as much hilarity on SNL. Hopefully she'll pop in after a little maternity leave, but I'm not sure if she's gone for good yet or not. But really, YAY for a baby! Second, Obama is going to be in Raleigh on Wednesday right. across. the. street. from my office. Also, right between my hubby's office and my mommy's office. AM SO EXCITED! WILL BE GOING! WILL PROBABLY CRY! No seriously, it's going to be awesome and I'm SO THERE. Third, Seth and I bought a junk-load of furniture last week. We bought ourselves a new bed, 2 bedside tables, a dresser and a coffee table. We thought furniture buying would come a lot later, but Restoration Hardware was having a 20% off sale and it was just too good to pass up. Here's a pic of our new stuffs (which is all back-ordered except the bed) that we'll get near the end of November. The picture only gives you an idea of what we got. The bed is the same except we got one with a lower foot board. Those are the same bedside tables we got, though. 3 drawers for putting junk in here we come! The dresser in the background is the one we got - too bad you can't see more of it. It's a dream. 11 drawers, 8 of which are completely cedar with dovetail joints. The top 3 drawers are felt-lined. ooooo. Anyway that's our stuff, y'all. I LOVE it. 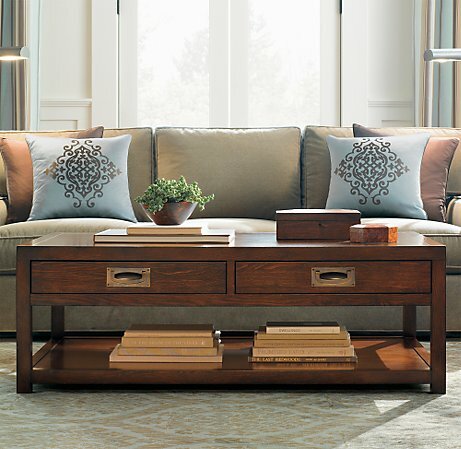 I've been a big fan of mission and craftsman style stuff for a long time and I think this furniture will tickle my fancy for eternity. We also got this coffee table in the same line of furniture. Clearly, I'm fond of the Larkspur, and there are several other pieces we hope to add in the future. It's a classic look and not a trendy take on mission. YAY RH! It's also worth mentioning that we love, love, love the couch in this photo and have 2 of them on our wishlist for future purchases. Maybe I need to go work at RH and get the dandy employee discount. Hmmm. So anyway, on to other news. I spent all day Saturday with my mom helping her get her house ready for her big 40th reunion with the NCSU Fellows. She's so excited so I wanted to help her as much as she needed me. She's had so much done to her house in preparation for this event. I don't care what it took to motivate her to get some things updated and renovated, I'm just glad something sparked her and got her going. Let's see...she's had carpets cleaned, pillows made, curtains made, a chair recovered, trim painted, house power-washed, bought a queen-sized bed for guests, repainted a bedroom, had the carpet ripped off the stairs and the hardwood underneath refinished, and got rid of a lot of stuff in the playroom (aka: relative's crap storage central). She and I spent 12 hours (no lie) on Saturday getting the upstairs cleaned out and presentable. She never goes up there so it was dusty and crowded and had turned into a catch-all for things people didn't have room to store at their own homes. It's now a sparkly, clean, organized retreat for her guests coming this weekend! I'm happy that's finally done and I hope my mom feels like some weight has been lifted off of her. I feel that way and it's not my house! I'm glad I took a whole day to help her do whatever she needed. We had as much fun doing it as you can have while cleaning. I think she appreciated the company, too. (Beside my one break down when my dad let Three get out of the house, all was well, but wewillnotrecountthatstoryorIwillgetmadalloveragain). Another thing...I like Beyonce's new song "If I were a Boy" and I dedicate it to all those idiot ex-boyfriends (well maybe just like 2 or 3 of them) who snoozed and losed and who probably STILL don't know how to treat a woman. What else? OH! I voted early last Friday! And, I totally VOTED FOR CHANGE. Duh. Haters & Elections. What gives?